Can Baby Clothing Rentals be Profitable? Option 1: They can buy their baby a new, trendy, and fitted outfit every 30 seconds so the child will always look good. Option 2: They can not buy their new baby clothes and instead follow the hand-me down model and recirculate slightly “discolored” clothing. Parents can give their baby their cousin’s “not so old” clothing and then turn around and pass it on to their siblings. The former option leaves a very stylish baby, but is incredibly expensive. The latter saves parents with some extra cash, but may subject their children to social humiliation with a hand-me down with stains in certain areas of their pants. Introduce Budding Babies: A revolutionary baby and children clothing rental system that allows parents to save money, stop the accumulation of obsolete clothes, and ensure their children always have un-stained and stylish clothes to wear. Acting as something like a Netflix for baby clothes, Budding Babies would provide a system where parents rent clothing and return them when no longer needed or wanted. While I was very excited by this idea, there were several problems with turning it into reality. I know very little about the baby-clothing industry or creating and operating a distributing channel, nor do I have no capital to obtain my first batch of baby clothing. This idea was also recently created by a Ycombinator company called PlumGear. And while the existence of a faster company does not necessarily exclude any other from entering the market, it definitely blemishes the advantage and thrill of being the first mover. The main, overarching, problem is the possible lack of a financially viable business model. There is no doubt that this idea can generate a substantial amount of volume; in 2010 there were around 308,000,000 people in the United States and roughly 62,381,000 were between the ages of 0-14. This number is predicted to grow to 65,441,000 by 2015 (Census.gov). 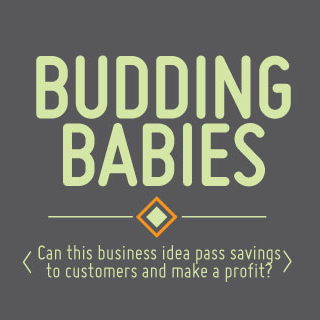 The real question if this business model can actually generate a substantial margin on those vast number of budding babies to first give the business a profit and second pass enough savings to the renters to draw customers. For this business to be viable, one only needs to look at the the potential profitability of every single article of clothing. This model focuses only on a shirt, but with the logic that the saving margins will be preserved, these numbers can be passed onto other articles of clothing. Ignoring any fixed costs, this marginal profit and marginal cost can also be quickly extrapolated to whatever magnitude of captured customer renters. There are several specific assumptions within this model. Every single of article of rented clothing must be 100% clean. It is obvious that customers, or renters, will only want to rent a piece of clothing if they can save a substantial amount of money on a per clothing basis. However, for the sake of this example we will ignore any potential changes in customer renter volume. And while a business like Budding Babies may be able to get discounts by buying in bulk, we will ignore that in this example and assume that it must purchase it at the normal price. This last assumption is the biggest assumption, but I think it is important to make because any newcomer would not be able to receive a huge discount for some time. 1, No profitability of with little customers. The first is a Break Even Rental Pricing model where the business, Budding Babies, creates no margin. In this scenario, it only passes 5% savings to the customer renters – a number that is frankly disappointing. If I were a renter, I would ignore 5% savings and buy my child a shirt that he/she can keep. 2, Losses of with customers. The second scenario is a more ideal savings rate that it could pass to its customer renters – we can see that by passing 40% savings to renters, it can lead to a $-9 (or a -36%) loss per shirt with a shirt that originally costs $24.76. While this saving structure will be more than enough to attract renters, it cannot be financially viable to Budding Babies, which take a massive loss. 3, Profitability, with no customers. The third scenario is a maximum profit scenario where Budding Babies passes no savings to its customer renters. Here, there is a $1 (or a 5%) profit gain per shirt with a shirt that originally costs $24.76. Ignoring the fact that renters will have no attraction to renting Budding Babies clothes, there can actually be some hope with making money. Based on my quick assumptions and analysis, I find it very difficult to imagine how renting clothes to parents can actually act as a viable business model. The first thing that needs to happen is price advantage of buying clothing for a cheap amount of money. Even at a cheaper rate, I find it difficult to imagine how much of a discount it can purchase clothing to actually make a profit by renting shirts. This leads to another issue; renters will expect a rate that is considerably cheaper than any purchase price. They may even require savings that surpass 40%, which in this model already puts Budding Babies deeply negative. While I still love the problem that this business may solve, I personally do not think it could be profitable. PlumGear, I wish you the best of luck and hope you show my assumptions and numbers wrong. If the price is right, there is a good chance I will use you to save my child from the humiliation of wearing a pillow sack.